A table saw is the undisputed must-have tool for any wood shop. From professional cabinet work to DIY home carpentry, few tools do as much to help you get the job done right. It can also carry a big price tag, so you’ll want to be sure you get the most for your money. Fortunately for you, we’ve done the research and compiled this convenient list for a number of applications. We’ve also chosen what we think is the best overall. Read our comprehensive reviews of each model on the list and buy with confidence. We hope you’ll find time to check this list thoroughly, but if you’re in a hurry, we can appreciate that. You’ll find our top choices for each category at the links below. If you’d like to jump right to our top-rated choice, read on. Choosing the right table saw isn’t always easy. The sheer number of brand names, types and features avaiable is daunting. There are a few very logical steps you can take to help narrow down the choices, however. The saw you choose should be based first on what you plan to do with it. There’s much more to that answer than cutting wood. Although most will certainly do that, many of these tools are best suited for certain situations. For instance, you may need one that travels easily from one job to another. In that case, you’ll probably want to shop for a job site saw or a contractor’s saw. Both tend to be lightweight, but rugged and often have large, dolly-style wheels for easy loading and unloading. Contractor saws are often built with cutting rough materials like cement tile backer and even metal in mind. If you’re a shop owner, a saw with a larger table and a more solid base may offer easier stock handling and higher precision. Cabinet saws usually feature heavy, full-height enclosures. The trunions – the mechanisms that support and move the blade arbor – are most often mounted to the cabinet, rather than suspended from the table. Hybrid options are a fairly recent innovation and are intended to function as both a contractor saw and a cabinet saw. They tend to be lighter than cabinet models, while offering wider table extensions and high-end fences and gauges. They may also have smaller, dual-voltage motors. There are also a great number of specialty options. These can vary from massive and sophisiticated sliding-table models to those with table inserts that accomodate other tools. Although we’ve mentioned this under the heading of Purpose, it’s worth a bit of further discussion. You absolutely must consider the physical size of the table saw you purchase. You also need to consider the area you’re going to need around it. This is important because a table saw in cramped quarters is unsafe. For instance, if you’re working with 4′ x 8′ sheet goods, and run out of room while cutting, you run the risk of damaging the material, the saw and yourself. Having a large machine in a small space is a recipe for disaster. Make sure you know how much room you have in your work area and choose your table saw accordingly. It’s also important to know the size of material your table saw will accomodate. This isn’t always apparent by the blade size, which is how most are rated. For instance, a 10″ table saw may have a very thick table. That may limit the depth of your cuts at 90° to something like 3″ to 3-1/2″. That’s not enough to cut through a 4″ x 4″ post, which means cutting from both sides. This becomes more limiting for bevel cuts. For instance, your saw may have a depth of cut as much as an inch shorter at 45°. What’s more, double-cutting bevels is much more complicated. Rip capacities on both sides of the blade are just as important. If you need to rip 4″ x 8″ sheets in half, you’ll need at least 24″ on one side of the blade. If you’d like to rip them at 30″, it’s much easier to do that while completely supporting that portion on the table. Know the capacities you’ll need for the work you’ll be doing. When in doubt, less is NOT more. 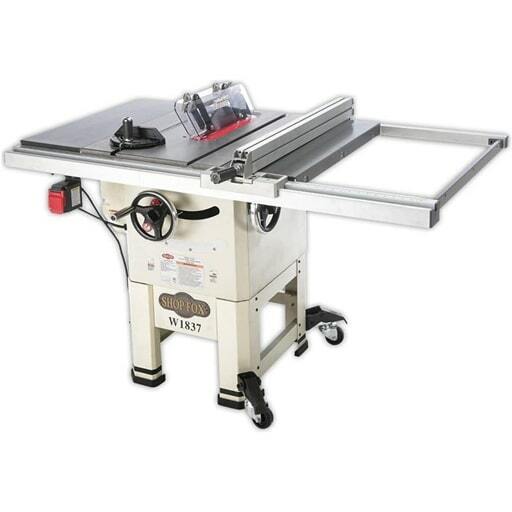 Table saw prices can be surprisingly high, with some industrial models well into and over the $7,000.00 range. While we won’t be discussing those in this article, there will be a few reviewed that may push the limits of your budget. Like any similar investment, limiting the amount you spend on a tool like this may impact the quality of your work. That isn’t always the case, and for the average homeowner or handyman the difference in price may be more important. If you know how much you can afford to spend on a table saw, you’ll find our recommentations according to price in this piece. If not, you’ll be glad to know that we’ve considered price as well as other factors in our reviews. No matter what you’re shopping for, some manufacturer’s names tend to draw more attention than others. This holds true in the table saw market, too. If you’ve consistently noticed a brand name on job sites, there’s probably a good reason. If a friend “swears by” a particular brand, pick his or her brain about it. If you’re considering a new saw for your professional shop, find out what your competition is using and why. While the name on the tool may not be the most important consideration, it should be considered. Fortunately, we’ve also listed our favorites from some of the well-known manufacturers. For those readers with a specific use in mind, we’ve compiled a list of carefully selected choices. Each one has been picked specifically for the category it is listed under. Are you the kind of woodworker that demands precision, even when working with the toughest woods? If so, the Grizzly G0605X1 Extreme is made for you. The heart of this machine develops a whopping 5 horsepower. Match that with a 12” blade and you’ve got enough depth of cut and torque to get through just about anything. Along with all that power, this model has the finesse you need for fine craftsmanship. The exact bevel angle is indicated with a digital display. A double-sided, precision rip fence lets you maintain rip accuracy. A riving knife helps prevent binding and kickback. Maximum stock support makes for steadier cuts and this saw doesn’t disappoint. In addition to the side extension table, an ample outfeed table supports long material after the cut. Both tables feature shelves near the floor for convenient storage. A sloped inner cabinet leads to a 4” dust port to fit even the largest dust collection systems. For serious woodworking, you’ll appreciate the quality in this product. For the novice woodworker or homeowner, a saw with all the “bells and whistles” can be a bit pricey, not to mention complicated. That’s why we recommend the SKIL 3410-02 for the beginner. This model is small, lightweight and extremely portable. More importantly in this application, though, it’s very simple and safe to operate. A self-aligning fence and “EZ view” measurement system make setting up for rip cuts quick and painless. The long extension on the clear blade guard provides easy lift while keeping your fingers away from the blade. Anti-kickback cams on both sides of the guard help avoid accidents, too. Another notable feature for the novice or do-it-yourselfer is the compact design. Although it extends to 32” wide, the table measures only 20” x 26”. 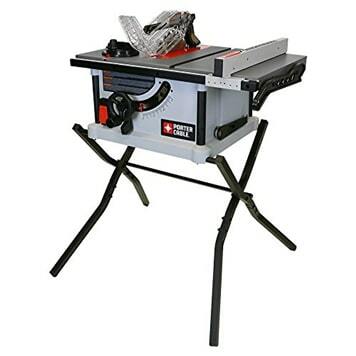 With its removable, folding stand and self-stored cord and miter guide, this table saw stows away easily. For all its simplicity and portability, this is a tool that will grow with you. The 10” blade and 15A, 120V motor will handle bigger projects when you’re ready. Do you need the power and durability of a chop saw, but lack space? Take a close look at The Shop Fox W1837. 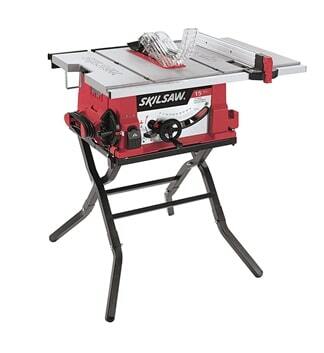 The smooth cast iron table and steel wings on this saw take up only 40-1/4″ x 27″ of space. The lightweight, open stand and three side-mounted casters make it easy to move – just step down on the foot levers and roll. Its small stature doesn’t mean that it won’t handle the heavy work. The 120/240V motor develops 2HP and turns a 10” blade. Rip capacity is 30” on the right and 15” on the left. Like its bigger siblings, this model features heavy-duty trunnions mounted to the cabinet and large, easy-to-turn hand wheels. A clear, split blade guard and anti-kickback pawls provide safer operation. There’s also a riving knife to maintain the kerf on your workpiece. The W1837 gives you everything you’d expect in a shop model, including a 4” dust collection port. What it doesn’t give you is a bulky, heavy cabinet and too much width to manage in a small space. On a job site, there are a several important features you need. – It needs to be easy to move, even for one person. – It needs to set up quickly. – It should operate on a standard service outlet. – It needs a stable platform. The DWE7491RS from DeWalt delivers all of the above. It also features something you won’t find on many on-site saws: a 32 – 1/2” rip capacity. Angled, folding legs make for a wide base. A big handle and dolly-style base provide easy relocation. With a total weight of 110lbs, all you need is a short ramp for safe one-person loading and unloading. While the motor uses a standard 120V supply, it draws a full 15 amps. That’s more than enough motor for cutting hardwoods. A depth of cut of 3-1/8” at 90° and 2-1/4” at 45° will handle the big stuff nicely. Best of all, a unique sliding extension and a fold-down shelf on the included rip fence make it easy to work with wide stock. That means straighter, more consistent work and safer operation. 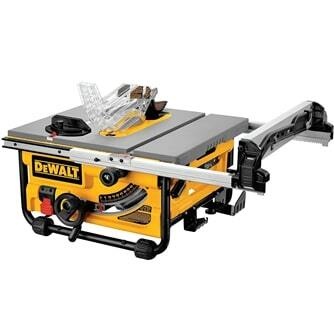 From framing to finish work, we think this saw will increase your on-site productivity. When it comes to commercial production capability, repeatable accuracy and durability, cabinet table saws are the go-to solutions for busy shops. The Jet 708675PK XACTASAW is our top pick in this category. The motor features a magnetic switch that prevents accidental starts after power loss. A push-button arbor lock makes blade changes fast. The poly v-belt drive makes it smooth and quiet. Jet built convenience into this saw, too. A deep drawer in the closed cabinet provides handy tool storage. Eight-inch hand wheels with spinner handles make adjustments quick and easy. There are an efficient dust collection system and safety features like a transparent blade guard and anti-kickback pawls. If you’ve got the room, this model has the power and features to make the most of it. There’s some disagreement concerning the type that fit in this category. We think the Powermatic 1791230K not only belongs there but deserves to be at the top. The open cabinet and sheet metal legs of this hybrid model dispense with a lot of the weight of a cabinet saw. On the other hand, a cast iron table and a melamine-topped extension table give it plenty of rigid working surface with a 50” rip capacity. A 120V/240V dual-voltage motor lets you run the saw on a standard service outlet. Since it delivers 1- 3/4HP, you can still power through the tough stuff and do it more efficiently at the higher voltage. A big, t-square rip fence and rack and pinion-adjusted, t-slot miter guide help you maintain precision. Also included are both full-height and low-profile, quick release riving knives. A split blade guard makes angled cuts safer. Big hand wheels with handles and a top-accessed arbor lock offer the convenience of higher-end machines. Storage for the accessories is provided like a contractor saw. We think this bridges the contractor/cabinet gap nicely, and the price is manageable, too. If you need a table saw that can take some punishment and follow you from the shop to the job, you might be a contractor. If you need it to be both compact and dependable, you should take a look at the Delta 36-5000. This 10” saw packs a dual-voltage, 15A motor and 5/8” arbor for serious work on-site or at home. With a depth of cut of 3-1/2” at 90° and 2-1/4” at 45°, it will take on the heavy stock. A right-hand rip capacity of 30” lets you handle sheet goods, too. A quick press on the right caster puts everything up on a tricycle caster setup that’s easy to maneuver in tight spaces. Drop the wheel and it settles in on tubular steel legs that provide rigid support with minimal weight. As you’d expect from one of the big names in power tools, the accessories you need for accuracy and safety are included. A t-square rip fence, miter guide and push stick all stow nicely on the cabinet for portability. The big, clear blade guard, oversize on/off switch and blade brake help keep saw operators out of harm’s way. It’s rugged, versatile and won’t break the bank. This brand has become known as something of a master in the compact power tools industry. This mighty little Ryobi is a good example of why. 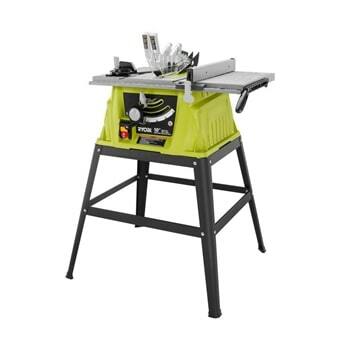 With a plastic base and a lightweight, detachable stand, this 10” saw is highly portable and at home on the bench top as well as the floor. A 12v, 15A motor develops up to 5,000RPM for fast cuts in most materials. The table measures 25” wide x 17” deep. Right-side rip capacity is 12” and you can rip 8” on the left side. A quick, lever-lock rip fence and miter guide are included, as well as a push stick that stores conveniently on the side of the table. The depth and angle controls and the power switch are all front mounted, for easy access. Ryobi has included some great safety features, starting with a split blade guard with independent, long lift handles. Anti-kickback pawls are mounted at the rear of the blade and the blade guard support can be re-positioned as a below-blade-height riving knife. 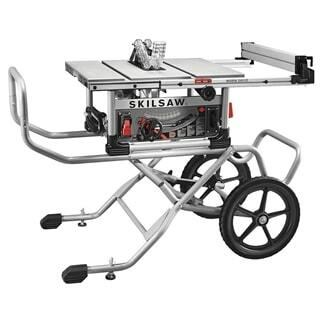 This saw isn’t an ideal choice for millworks, but for the hobbyist or homeowner, it’s a nice portable table saw at a great price. Here’s a brand that’s made a name for itself in several fields. Our top choice in their saw line was a contender in the hybrid category above and carries a much lower price tag than the winner. With a cast iron table and a 13-amp, 120V motor, the Ridgid R4512 10” is at home on the job or in the shop. A maximum depth of cut of 3-1/4” at 90° and 2-1/4” at 45° is ample for most materials. So is the 30” rip capacity on the right side of the blade. The front rail-mounted power switch and split blade guard help avoid mishaps. A miter guide, lever lock rip fence, and push stick are all included and everything has its own storage location. For added convenience, built-in casters raise and lower with a single foot lever. This model will suit the handyman or contractor at a relatively low cost. Are you in the market for extreme portability and easy storage? Here’s a 10” table saw from Porter-Cable that will fit the bill. This compact saw has an extremely small footprint but boasts a 15-amp, 120V motor. It turns a 10” blade at a no-load speed of 5,300RPM. A right-side ripping capacity of 16” lets it handle fairly wide stock, while the coated, cast aluminum table lets it slide smoothly. To facilitate floor use, the saw cabinet drops securely on a folding stand, bringing the table height to 30”. Safety is facilitated with a locking power switch and large, transparent blade guard. Best of all, when it’s not in use, simply lift it off, fold the stand and stash the whole thing in a closet or corner. If space is at a premium or you need a saw you can toss in the car, check this one out. When you look at the high end of the table saw scale, the Delta name will be there. This 5HP Unisaw is one of the many reasons. This machine doesn’t just look like a high-tech piece of equipment; it is one. It’s engineered for quiet, smooth, precision operation and the raw power to get through tough jobs fast. It starts with a 5HP, 240V Marathon motor coupled to a 5/8” arbor. That drives a one-piece trunnion connected to a massive cast iron cabinet. The result is a powerful, extremely accurate, vibration-free powertrain. Depth and bevel hand wheels are front-mounted, centered over a precision bevel gauge and fine-tuning dial. The cast iron table features t-slots for the included precision miter guide. A full 52” of rip capacity is precisely controlled with the Biesemeyer fence. A split blade guard shrouds the left-tilt blade all the way to its maximum bevel. Everything stays cleaner with a dual-level dust extraction system. 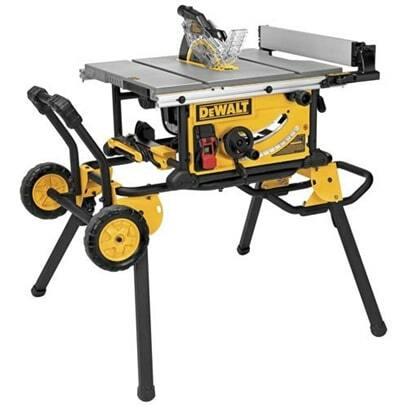 This isn’t a handyman table saw and it isn’t for every budget. For the discriminating professional, it’s in a class of its own. 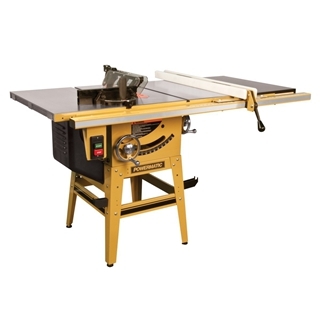 When a company manufactures so many top-quality woodworking machines, it’s hard to choose their best table saw. 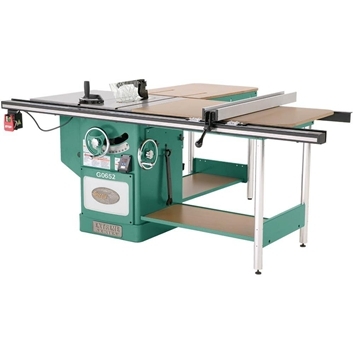 We’re giving this spot to the Grizzly G1023RLWX because of an added feature: a built-in router table. 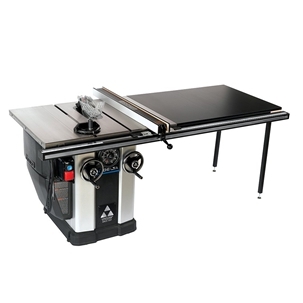 This is cabinet table saw is a beast, with a 5HP, 240V motor and smooth, quiet poly v-belt drive. Cast iron trunnions and a milled and polished cast iron table help keep vibrations to a minimum. Oversize hand wheels move the 5/8” arbor effortlessly. 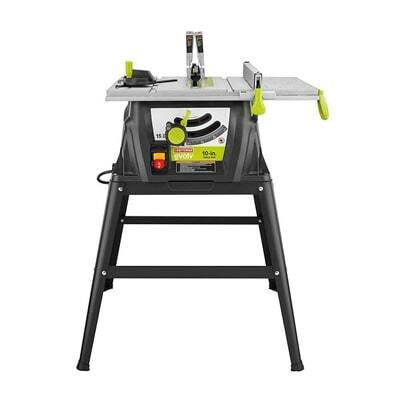 A hefty, precision rip fence, riving knife and t-slot miter gauge are included. Add the sealed ball-bearings, dust collection port and powder coat finish and you’ve got a saw that will handle the toughest jobs you can throw at it. The router table extension adds more convenience than meets the eye. You can easily go right from cutting to shaping. Cut dadoes without changing saw blades. Since it shares the rip fence, you’ll have fewer accessories to keep track of. We’re sure you’re already thinking of the ways this table saw/router table combination can speed up your projects. If cost is the most important factor in choosing a table saw, we’ve got you covered. Take a look at the list below to see our top choices in specific price ranges. This isn’t a price range that many readers will be shopping in. If you need the highest possible precision and splinter-free cutting, however, you’ll want to consider a sliding-table saw. 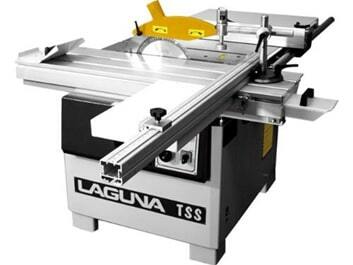 The Laguna TSS Tablesaw w/ Scoring is one of a few such saws that fit inside this budget. If you’re looking in this category, we won’t need to explain the reasons for such a table saw. We’ll simply say that our pick provides the functionality of bigger saws for as little as half the price. 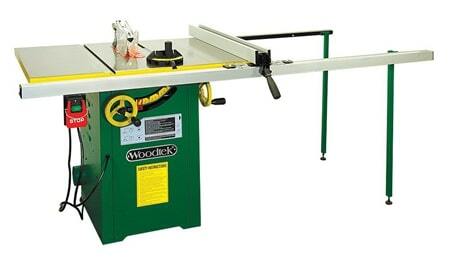 If you’ve been wondering about “European-style” table saws, take a look at this one. 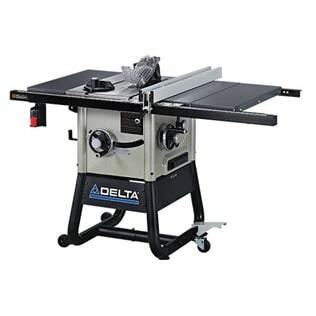 This table saw has almost all the features of our top pick for woodworking, with a 10” blade. If you need a saw with guts, the Grizzly G0652 is a bargain at this price. The 3-phase, 240V motor, precision miter guide and rip fence give you all the power and accuracy of its big brother. An outfeed table and 52” rip capacity make handling sheet goods and long stock a breeze. Safety features like a magnetic switch and spreader blade guard reduce hazards. 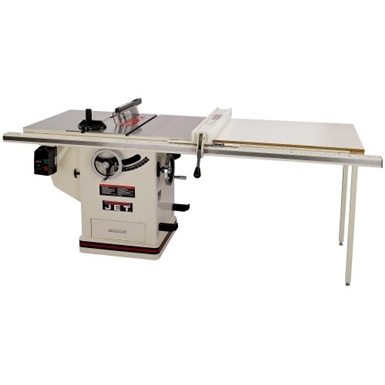 For a pro shop with room and the power supply, this table saw is a great investment. Here’s a hybrid table saw that packs a lot of punch for the money. The Woodtek 159665 is among the most powerful and versatile in this price range. With a cast iron table, 2HP dual-voltage motor, riving knife and dust collection system, you’ll have all the main features of a cabinet saw. An open extension with legs increases rip capacity to 52”. The miter guide and industrial fence help ensure repeatable accuracy. With its built-in tripod caster system and flexible power requirements, it will load up and go like a contractor saw, too. It’s a lot of tool for the price! The SKIL SPT99-11 gets top honors in this price category, over several table saws that cost more. This job site saw has enough torque and capacity to double as a shop saw. SKIL’s worm drive set the standard long ago in their contractor’s hand saws. This portable 10” table saw puts it to work perfectly. 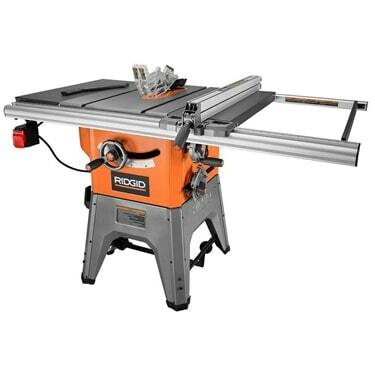 The table and rack and pinion-adjusted extension provide a 30” rip capacity and 3-5/8” depth of cut. The innovative stand/transport system completes a package that delivers plenty of cutting power wherever you need it to go. This compact table saw is in a class of its own – it’s cordless! The DeWalt DCS7485T1 is powered by the Flexvolt 60V MAX battery that delivers the right voltage for the tool it’s plugged into. That makes this saw part of a versatile tool system. This isn’t just another cordless tool; it’s a surprisingly solid, compact table saw. With an 8-1/4” blade and 24” rip capacity, it takes on sheet goods and solid lumber. It’s also built with operator safety in mind, with a magnetic switch and full blade guard. You’ll be surprised at the quality of this saw. DeWalt wins again in this price range. 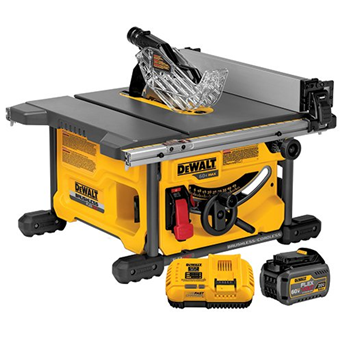 This time, the DW745 compact table saw is our choice. Designed for the job site, this portable saw carries a 15-amp, 120V motor to handle most materials with ease. It features a left-tilt arbor and a 20” rip capacity. The cast metal table with rack and pinion extension provides a sturdy surface. A split blade guard covers at any angle. It comes with a miter guide, push stick and fence as well as a 24-tooth carbide-tipped blade. There is no stand, but for this price, it works great on a table or bench. 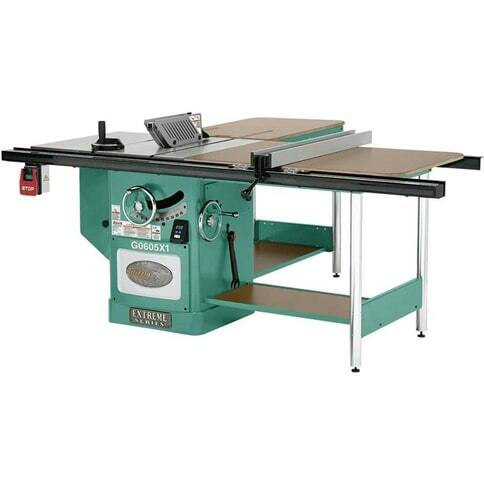 Would you be surprised to find a brand-name, floor model table saw in this price range? We were, too. Take a look at the Craftsman Evolve 28461. For the casual hobbyist or homeowner with a tight budget, this is a good piece of equipment. It’s a 10” saw, powered by a 15A, 120V motor in a lightweight, open cabinet. It even has a tool-less adjustable spreader/riving knife and a split blade guard. It comes with a miter guide, rip fence, push stick and a 24-tooth carbide-tipped blade. It’s a good choice for anyone on a limited budget. Our top choice overall is based partly on a unique set of features. 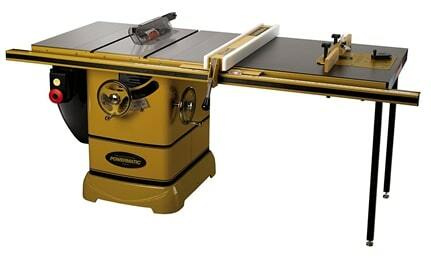 The Powermatic 1792001K table saw kit delivers brilliant solutions for cutting, grooving and edge shaping. The kit starts with Powermatic’s PM2000, 10”, 220V single-phase, 3HP cabinet saw. This workhorse gives you a 5/8” arbor on a cast-iron trunion system with a unique worm drive that maximizes gear contact. It even features backlash adjustment to maintain clearances. Eight-inch hand wheels and retractable casters make for easy adjustment and repositioning. A push-button arbor lock simplifies blade changes. Big, easy-access controls, a true riving knife and a magnetic motor switch offer maximum safety. 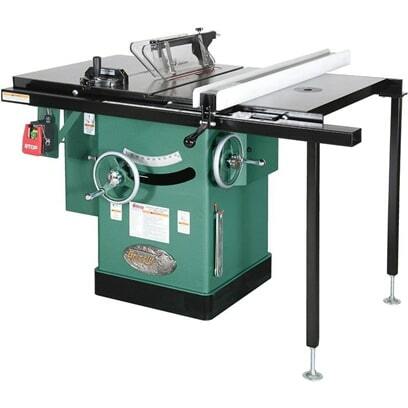 This table saw kit also comes with a 50” extension for unprecedented capacity and an industrial rip fence. It also includes a precision, micro-adjustable miter guide. About shaping and grooving: The extension is fitted with Powermatic’s drop-in Rout-R-Lift system. This lets you mount your router for hands-free work, including top depth adjustment and an included, adjustable fence. It doesn’t get more convenient. From cabinet building to door and trim work, this setup has the power, capacity and versatility to get the big jobs done. Buy it now and never outgrow it!